In preparation for a Georgia wine trip planned for next year, I spent quite a bit of time on the Georgia tables at the Autumn SITT tasting, and now feel I have much better idea of what to expect. For example, I now have expectations about the main red and white grape varieties, Saperavi and Rkatsiteli, and the qualities imparted by qvevri maceration. Some misapprehensions doubtless, but expectations nevertheless. At the tasting, two producer representatives were kind enough to let me take away bottles of the wines I liked best. Please don’t read too much into my selection – I am always hesitant to judge on a quick sniff and swirl, but for the same reason I was very glad to have the opportunity to re-taste at home, and drink the wines with food. As far as I know, neither producer is represented in the UK, so I do not know for sure what the prices would be here. However, the Maranuli is at the top end of the producer’s range, and the Askaneli towards the bottom. Comparing with the price range for Georgian wines in the UK that could imply retail prices of around £25 and £12. Not all wines on the Georgian table were as good as these two, but that of course would hold true for wines from any country, and on the whole they were attractive and offered a lot of interest for my West European palate. The only wines I could not contemplate drinking were the medium sweet reds, which I was told are now produced mainly for export to ex-Soviet countries, the Georgians themselves preferring dry wines. I doubt very much they would sell well here but, for those that do like that style, Georgia pretty much has the market to itself. This entry was posted in My tasting notes and tagged georgia, qvevri. Bookmark the permalink. I’m trying to drink a bit more Georgian wine. A visit there sounds interesting. I saw Decanter did a travel piece on Georgia a while ago. Also, have you read Alice Feiring’s book For The Love of Wine, on Georgia? I haven’t, but it was on sale at Raw and it looked interesting. I was tasting at La Pinte at Arbois last week and Laura from there had been making wine in Georgia with her Georgian partner. One possible word of caution – Wednesday’s Evening Standard had a small piece on demagogues and dictators on the comments page. There are lots of statues of Stalin in Georgia and apparently he is very popular. The writer was warned not to slag him off as he might get beaten up! Not all Georgian wines are equally to my taste, but I too have certainly decided they deserve more exploration. I am very aware of Feiring’s book, but from what I have heard about it, and her writing in general, I think I would find it annoying. I still might get it though. Stalin is no doubt a (let’s say) controversial figure in Georgia. But, as you probably know, large chunks of Georgia are occupied by Russia, which is a bit of a sore point, so I am sure support is not universal. But yes, I have no intention of shouting about politics on my trip. Avoiding politics and religion remains good advice! I shall try to stick to enjoying the food, drink, singing and dancing – I understand the Georgians know how to do all four very well. I tasted quite a lot of Georgian wines at RAW and liked some thought others just too tough. However, I tasted a lovely one from the Alaverdi monastery in Edinburgh last December, wild but very drinkable. Enjoy the visit, it will certainly be different and a real adventure. Thanks Alan – it is a rare country where you like all the wines! One wine I did quite like was the very simple qvevri wine which M&S were selling (with an orange label). Not sure whether they still do it (very large stores only). I think they had two or three Georgian wines a year ago, in what is a pretty adventurous range (which well deserved that Decanter Award. I was not surprised at all to be told (in the WFW article on qvevri) how little wine is actually made in Georgia by this traditional method, how much other wine they make, and how even with qvevri wine, little is orange – only the whites from the warmer regions. That article also taught me how to pronounce qvevri…like qvevri. …sorry, meant like qwevri- auto correct has got clever! Yes, I was aware that qvevri wine is relatively uncommon in Georgia, and also that whites are sometimes it is taken off the skins into another qvevri to age. Sounds like some are also fermented off the skins from what you say. Didn’t know about the pronunciation though, and still trying to figure out why some say the transliteration should be kvevri. Oh – and I had forgotten Stalin came from Georgia! In short: there are two “k” letters and one “q” in Georgian. The Georgian name is actually “kvevri” with a “k”, not “qvevri”, but as the Georgian “q” letter is located in the place where “k” is located in the Latin alphabet, Georgians often write the word as “qvevri” when transliterating them to Latin alphabet. I really love Georgian wines and I’m always thrilled when I see somebody is writing about them. 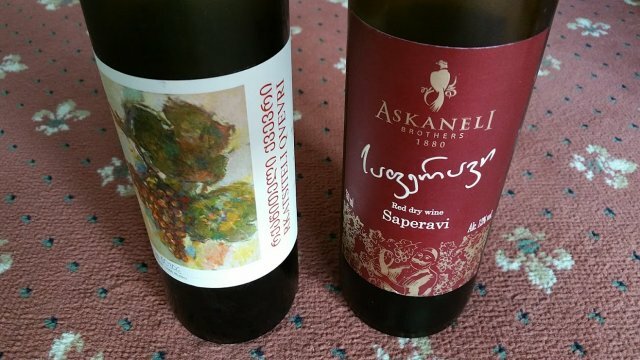 I don’t know how many Georgian wines you managed to sample, but as the Saperavi you reviewed here seemed quite low on tannins, I must warn you that Saperavi wines are often really tannic – even more so, if they are kvevri wines from the Kakheti valley. I myself don’t usually mind the tough character, but I’ve seen many people deem these wines nigh undrinkable because of their really tannic and quite astringent structure. And, of course, you can find some orange (/amber) wines as heavy in tannins as well. They just aren’t as commonplace as tannic Saperavis are. Furthermore, I suggest you take another try at the semi-sweet Georgian reds. Of course a majority of them are cheap and uninteresting swill for the former Soviet market, but the best can be really wonderful and unique – something not unlike good Port wine, without the alcohol and extraction, whereas the others can be full of character you can’t find from any other wine. For example good Kindzmarauli and Ojaleshi wines can be really tremendous! I use them as my secret weapon when you’ve got a difficult cheese platter with really different cheeses that don’t have anything to do with each other. These somewhat sweet and often still rather light red wines with moderately high, balanced acidity excel in those kinds of situations, really. Hi Otto – thank you very much for your comments. I had either forgotten about that keyboard explanation for the “q”, or it was not in the Wikipedia article when I last read it a few years ago. I blogged about qvevri wines before using the “k” spelling, but it now seems pedantic not to write “qvevri”. I tasted several Saperavi wines at SITT, and from my very brief impressions they had very different levels of tannin. One of them was certainly very highly astringent. I will certainly continue to at least taste Georgian sweet wines. The comment in my post meant to imply only that I did not want to drink the ones I tasted. Even then, there was one wine that was more palatable to me that the rest. It was obviously intended for Western English-speakers by Madam Wines, and called Coquette. It seemed to be less sweet, and had better balancing acidity. I should also point out that I am usually quite fussy when it comes to sweet wines.